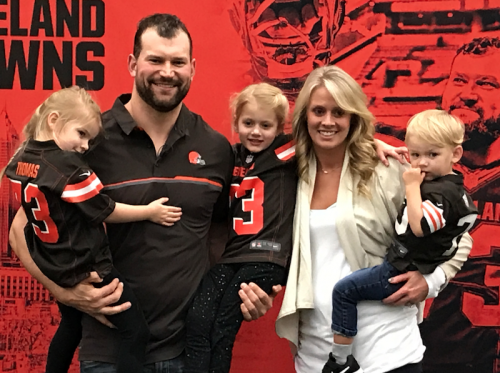 Former Cleveland Browns player, Joe Thomas is this week’s guest on The Life of Dad Show. Joe Thomas stops by The Life of Dad studio to talk with Art Eddy and Jon Finkel about raising his kids, a new baby along the way and how kids like to bend the truth. Joe also chats with the guys about playing in the NFL, his take on HBO’s Hard Knocks, and life after football. Oh yeah….they also talk about beer! Joe Thomas played offensive tackle for the Cleveland Browns. He played college football for the University of Wisconsin, earned unanimous All-American honors, and was recognized as the top college interior lineman. The Browns chose Thomas with the third overall pick in the 2007 NFL Draft. He was invited to the Pro Bowl in each of his first 10 seasons and did not miss a single play in his career until the 2017 season. which was his final season in the NFL; his 10,363 consecutive snaps played is the longest streak since the NFL began recording snap counts in 1999. Joe also co-hosts a podcast called The ThomaHawk Show. It is a weekly podcast hosted by NFL veterans and former teammates, Joe Thomas and Andrew Hawkins. With a combined 10 Pro Bowl selections (all Joe’s) and two college degrees (both Hawk’s), this is your one-stop shop for fun NFL stories, unintentional comedy and a touch of bromance. The very best of Life of Dad…PODCASTED! Featuring your favorite hosts, Art Eddy and Jon Finkel. Life of Dad is the first ever and fastest growing social network for dads. Featuring thousands of blogs, videos, podcasts and more, Life of Dad is the one-stop entertainment destination for fathers. Sit back, crack open a brew, and connect with dads from all around the world who are sharing their funny, entertaining, and heartwarming stories on Life of Dad.